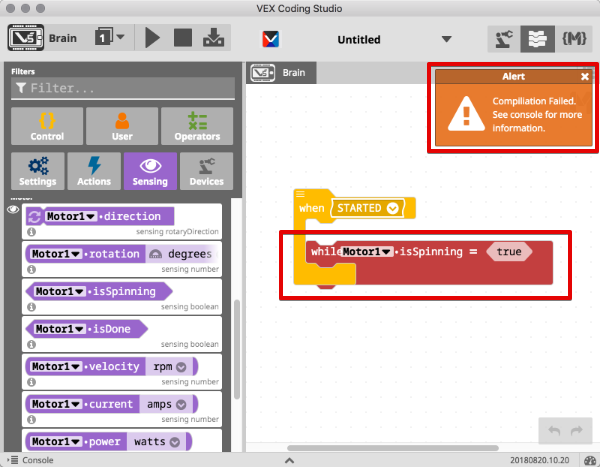 Notice that if VEX Coding Studio cannot turn your code into a working robot program, a "Compiliation Failed" message will be displayed. Remember, additional indicators may appear depending on which language you are using. In Modkit Block, blocks with errors will turn red. 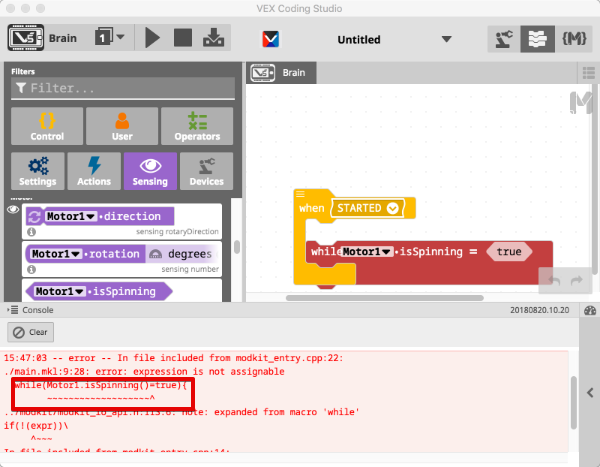 In VEX C++ and C++ Pro, a red circle containing an "x" will be shown next to the line of code with an error. NOTE: These indicators on their own may be sufficient for you to determine the cause of error. If so, skip ahead to Step 4. Double-click the ⌃ button at the bottom of the window to open the Console drawer. Alternatively, drag the gray Console drawer slider up to slide the Console drawer window open. Scroll through the Console text area until the red error message is clearly in view. If you have more than one error, start from the topmost. Check the arrow that points to a specific part of the code to pinpoint the cause of error. Retry downloading your program after making your changes. NOTE: If you have corrected all errors, a "Download complete" message will be displayed. You may wish to clear the Console text and/or close the Console drawer window before continuing.